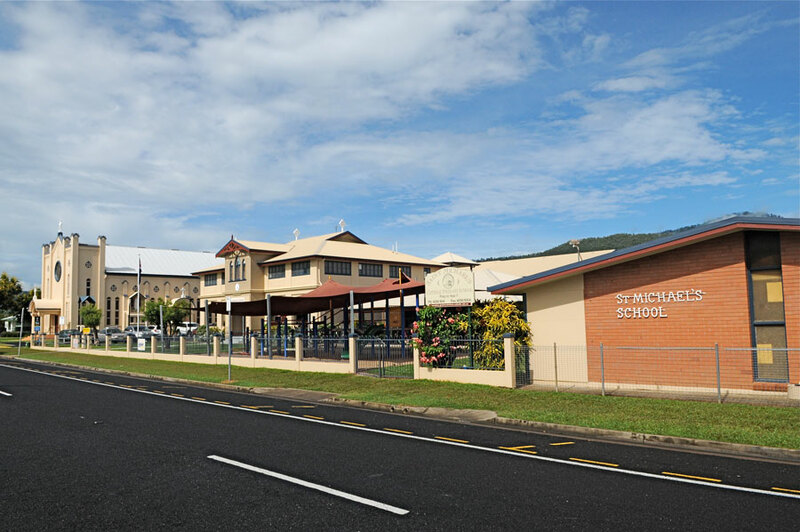 St Michael’s School is at 58 Mill Street in Gordonvale; a rural, country town on the fringe of the city of Cairns, in Tropical Far North Queensland. Gordonvale is situated on the Bruce Highway with Edmonton and Cairns to the North and Babinda and Innisfail to the south. It is about 23 km south of the Cairns central business district and is just east of the Gillies Range which leads to the picturesque Atherton Tableland. A prominent natural landmark is Walsh’s Pyramid, which rises steeply to 922m. Gordonvale has a population of about 4,500 people and is a town with a culture of its own. Urban sprawl has resulted in Gordonvale becoming a southern suburban extremity of Cairns. The suburb is surrounded predominantly by sugarcane fields and St Michael’s School is only a ‘stone’s throw’ from the operational Mulgrave Sugar Mill. A bus service to the north and south of St Michael’s helps get students to and from school every day.